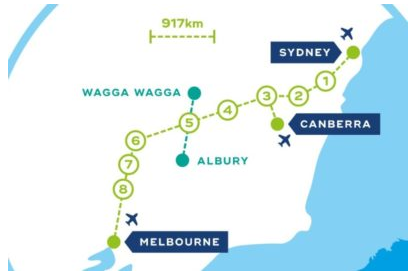 Consolidated Land and Rail Australia (CLARA) has collaborated with several international companies in order to develop a plan for a new high speed rail that will connect 3 of Australia’s largest cities. The ambitious proposal includes construction of eight brand new island cities between the Melbourne, Canberra and Sydney, all connected via speed rail. The high speed train line is aimed to run at 350km per hour and is estimated to be just over 800km long. CLARA is set to join with 3 of the world’s best high speed technology conglomerates. These include: Japan’s Super Conducting Magnetic Levitation Train, France’s TGV and China’s HSR network. The proposal was made to rebalance Australia, as both Sydney and Melbourne make up a whopping 46% of the total population of Australia. Nick Cleary, CLARAS cofounder, stated that the express service will get commuters from Sydney to Melbourne in under an hour, whereas non-express will only take two and a half. Well judging from the overall proposal, it will cost around $200 billion to build with $13 billion alone for the high speed rail. Additionally, it will take just under a decade to have to plans put up online, and over 20 years to construct. But the benefits outweigh the cons. With this speed rail in place, Australia’s regional development will make progress. Decentralization of the population will occur, and commuting from state to state will become both quicker and more convenient. Talks of a high speed rail have been thrown back and forth for decades but have only been seriously reconsidered post-election. Australia is the only continent (with the exception of Antarctica) without having a high speed rail of its own, so it’s about time we did.